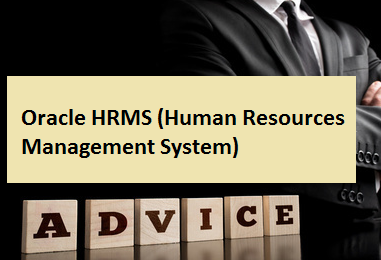 In this article 'oracle hrms (human resources management system)', you'll get more information and details help with your career knowledge, feel free to copy or share. Oracle Applications for Human Resources helps an organization in hiring, training, and deploying, assessing, motivating and rewarding its employs more efficiently than ever before, there by turning the HR into a strategic-level function and primarily responsible in the enterprise’s success. By the process of automating its administrative duties, providing self-service for non-HR professionals, and administration information more efficiently, HR experts can utilize their time and ingenuity to bring the highest value for the enterprise's investment in people. The Oracle HRMS applications are component of the integrated, enterprise-wide solution Oracle e business Suite for information management that comprises of software for managing finance, sales and marketing, the supply chain and manufacturing. The Oracle HRMS application module consists of the following: Oracle Human Resources, Oracle Payroll, Oracle Training Administration, and Oracle Time Management. Oracle Human Resources is a practical management solution that helps to maintain the costs under control at the same time as developing and supporting an effective workforce for the organization. Oracle HR can be used to organize to equal the organization's business goals and processes and be automated to complete numerous tasks including: organization and position control, recruitment processing, employee profiling, career development and the management of compensation and benefit policies. Using these practices can help; turn the human resource departments into a strategic function that is very useful of the enterprise. Oracle Training Administration enables the company to develop the capability of the employees so as to meet current and future objectives in a cost-effective way. The module allows company to handle any development activities which advances skills, for example remote site learning, work experience, formal class tuition, external seminars. Oracle Training Administration is totally integrated with Oracle Human Resources and the Oracle Financials applications to make sure that the organizations advances training delivery to the skill requirements of jobs. Oracle Payroll is a high-performance, graphical, rules-based payroll management system made to keep rapidity with the changing requirements of the enterprise and its personnel. Each corporation has a exclusive payroll which helps to organize its payroll solution without having to lose the advantages of a standard, supported package. Oracle Payroll offers that capability through a unique, data-driven approach that enables organizations to define and manage its various payroll requirements. Time collection and processing is a complicated and time consuming work that should be completely accurate to produce a correct paycheck. Automated, accurate time management can help other functions within the organization. Oracle Time Management aides the organizations to manage complex pay structures, track total hours worked, job classifications, vacation time, and a range of company and union pay organization. Oracle Time Management guarantees that the accurate number of time entries and hours are established from any locations, which in turn helps to create a valuable study of the productivity of the employee. By the means of providing clientele with assurance, accountability and flexible back- to-back solutions, Oracle Applications has recognized new standards for excellence in enterprise applications and extending its control in the applications area.